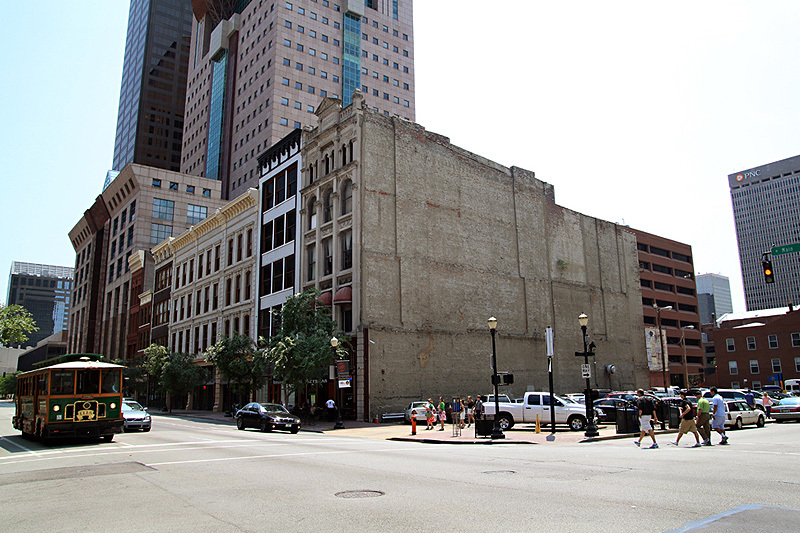 Today, the southeast corner of Sixth and Main streets is a surface level parking lot, but at one time, it was the grand Hamilton Bank Building (also known as the Hamilton Block). The Renaissance Revival structure dates to the mid 1860s and was designed by Frank W. Vogdes. A number of tenants were housed in the structure including the National Bank of Louisville, Northern Bank, Union National Bank, and later the State Board of Health. 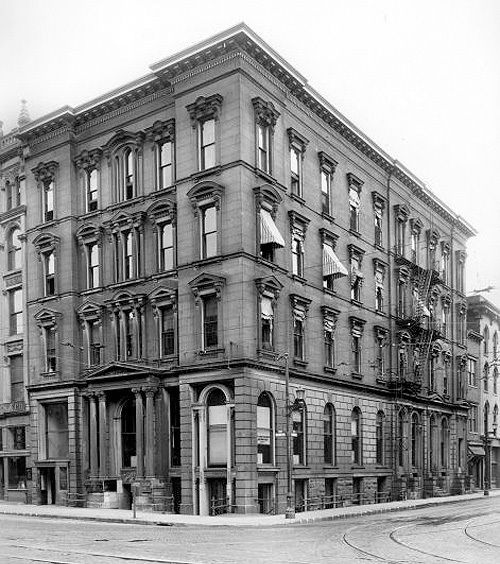 According to the Encyclopedia of Louisville, the National Bank of Louisville was chartered in 1863 and was the oldest national bank south of the Ohio River. According to Sam Thomas’ The Architectural History of Louisville, Vogdes differentiated the horizontal divisions of the structure by implementing an inset entrance with dual columns and narrow windows. The historic photo below was taken in 1926. The structure represents an early example of design emphasis on the basement level entrance. According to a city directory in 1926, the lower level was occupied by a cigar and candy shop. If you look closely, you can still see a sliver of the Hamilton Block on Main Street on the party wall next to Los Aztecas restaurant. It’s the rusticated stone piece on what would have been the building’s first floor. Anyone know when the structure was demolished? You might also find our recent comparison of the view north from this location interesting. You got me, man, I admit it. I looked at that photo and thought it was real and I thought, when was this taken, I know that corner has been cleared for at least 20 years, probably a lot longer than that…then I saw the other pictures…lol…if only real “restoration” were so easy…well done! The building has been gone since at least 1980. The Los Aztecas used to be a local bar called Charley`s with their name painted on the western wall of the building. I remember clearly as my mother often parked in that lot and ran into the bar to pull my step-dad out on the way home from work. Excellent way to present what once was. I like this idea very much. It would, in my mind, be all the beter if it coincided with the new mayor’s first day in office. I love the photoshopping on the Lost Louisville series. It’s so effective. I hope you have a long series of these in the works. What would be really visually striking would be scale models. Take Broadway for instance; imagine two models, one of the street in the 1920's with the 2nd Presbyterian Church, the James C Ford Mansion, and the Baptist Seminary, and another of the street today. If displayed in a high pedestrian traffic location, those models could go a long way towards showing the general public the importance of historic preservation. Don't you people understand that making an easy buck is more important than architecture? The Louisville Historical League held a mock funeral for a threatened building several years back. Deborah Stewart was president of the organization then. We had an old fashioned hearse and a “funeral procession” complete with a New Orleans style jazz band. The Grim Reaper even showed up. We had plenty of RIP signs as I recall. I think it would be a wonderful photo op that would garner lots of publicity. I think it would be entirely appropriate for Preservation Louisville, LHL, NPP, and others to join in on the effort. Wow, I can’t believe my idea had already been used (I wasn’t in Louisville then)… I would love to see this happen. Why do these “developers” always seem to pick out the most ornate buildings on a block to convert into parking lots? This building was demolished to create parking for Burdorf Interiors which had a showroom in the Morgan & Pottinger Building on the North West corner of 6th and West Main Street. When I was 7 years old I lived in that building. That was in 1951. I.m sure the rent vary low for we were vary poor. We lived on the 2nd floor facing 6th. street. I remember it being in bad repair and smelled bad.